Swanton Mayor Ann Roth reads a proclamation honoring Kevin Salkil, left, during last Monday’s Swanton Village Council meeting. A presentation and a proclamation highlighted the Swanton Village Council meeting last Monday. 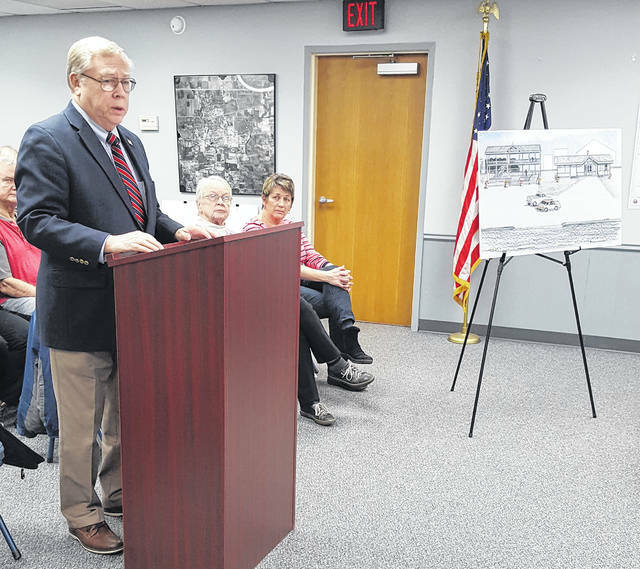 Neil Toeppe, Swanton Chamber of Commerce and Swanton, Ohio Historical Society president, spoke to council about the historical society and the possibility of bringing railroad related history to Chestnut Street in Swanton. “The Village of Swanton’s Motto is Honoring the Past, Committed to the Future. And I stand before you to talk about that motto and how we can bring meaning to it,” Toeppe said. He discussed the possibility of relocating the Brailey Depot and an A.D. Baker steam engine, and constructing a viewing platform on village owned land on Chestnut Street along the railroad tracks. He suggested that could increase foot traffic on Main Street and in turn increase business on Main Street. Also at the meeting, Mayor Ann Roth read a proclamation honoring Fire Captain Kevin Salkil. Salkil began his career with the Swanton Fire Department over 20 years ago and retired on Jan. 14. According to Roth, Salkil was bestowed an award by village council in 2001 for saving a human life at an accident on Airport Highway. 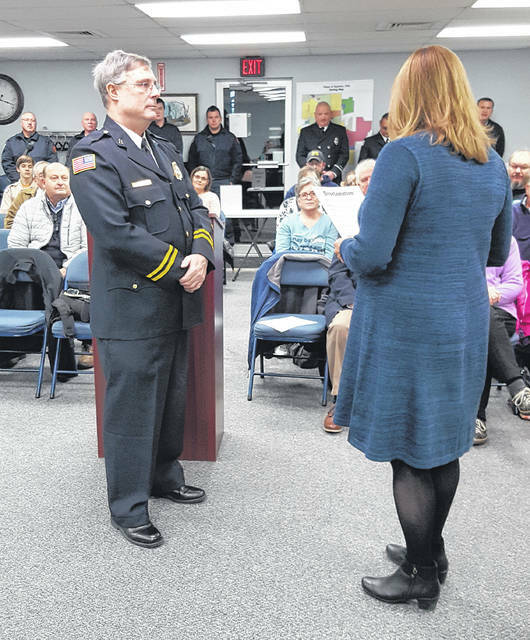 “Captain Salkil has demonstrated, throughout his life and career, a sense of deep responsibility and pride in his commitment to both the Swanton community and fire and emergency medical services,” said Roth. • Paul Dzyak was elected council president for 2019. • Council passed, by emergency, an ordinance for renewal of the countywide Emergency Management Agency. • Council passed, by emergency, an ordinance accepting agreement terms for Memorial Park pavilion project. The ordinance is the next step in the NatureWorks grant process. • Council approved a pair of emergency ordinances to enter into agreements with Poggemeyer Design Group. They are for the Memorial Park pavilion project and Safe Routes to Schools project. • Council approved waiving a $150 fee for Swanton Alliance Church’s recent use of the Swanton Community Center. They requested the fee be waived because they are non-profit and only used the center for about an hour, according to Village Administrator Rosanna Hoelzle. • Roth reported on a recent community outreach by the Swanton Fire Department. In December, they delivered food and gift items to three locals families that had one or both parents pass away during the 2018 calendar year. • Hoelzle reported that a public forum will be held Feb. 28 at 6 p.m. for the Memorial Park Master Plan.